Edo State Governor Mr. Godwin Obaseki has disclosed that the greatest challenge facing Nigeria as a nation is that of waste, saying that there is so much waste in this country. The Governor also said that now is the time to think about how to reduce corruption and waste in the country. He made this disclosure during the Chevron 4th Triennial Branch Delegate Conference themed: “The role of Trade Union in a Challenging Economy”, at Precious Palm Royal Hotel in Benin City Thursday. “It is time to think about our country and how to reduce corruption and waste. Our problem is not having enough but we mismanage so much of what we have. Transferring technology and building local expertise and the ownership of local oil industry should now be part of your interest; leading Nigeria to a more prosperous economy beyond oil should be your interest. The language of the struggle must therefore now change from you against us, but for us working together to make Nigeria a top economy in the world”, he said. The governor said the common enemy of Nigeria is poverty, hunger and want. He called on Nigerians to unite in the fight for the soul of the nation. In addition, Obaseki noted that the goal of his administration is to create a state that has the best and friendly environment for doing business in Nigeria. “Our plan is to partner with you in your industry to utilize the huge gas reserve in our state to electrify and industrialize Nigeria. We are willing to support your idea from this conference and to partner with you in providing jobs that can grow our local and national economy”, he said. Meanwhile, Obaseki assured the participants that within the next 12 months the difference would be clear in the city. He based this assurance on the commitment of his administration to improve the lives of the people of the state, to improve the infrastructure, create jobs and ensure that there is security in the state, as this will ensure the people live in happiness. He said, “As you search for the solution of this conference, remember that to save and salvage Nigeria is a task for us all. 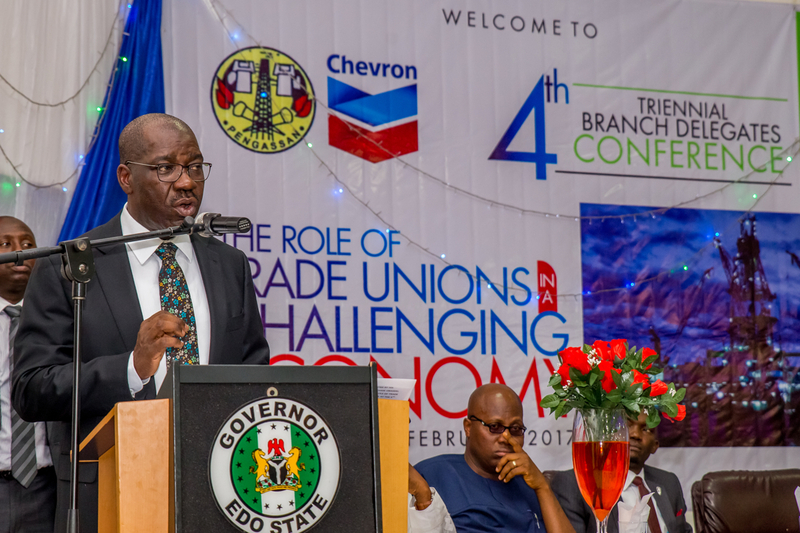 As you search for ways to diversify the economy of our country and bring eco-friendly and raw investment into the oil and gas Industry, be reminded that Edo State is ready to do business”.